Please add $19.50 for shipping, handling, & insurance. Usually ships within 2 business days. Please select your choice of Thomas Kinkade frame when ordering this item. Please add $40.00 for shipping, handling, & insurance. "For the second work in my Sweetheart Cottage collection, I've conjured a vision of a perfect romantic hideaway. Falbrooke Thatch is nestled right next to a charming little waterfall, with an arched footbridge leading from the front door over the falls. I've devoted Falbrooke Thatch to Valentine's Day (note the 214 address just below the heart-shaped window) and to romance. In fact, I've hidden hearts throughout the painting. The more hearts you can find, the more romantic you are." Sweetheart Cottage II copyright© 1993 by Thomas Kinkade is prohibited from being copied. All applicable copyright© laws apply and are reserved by Thomas Kinkade. Thomas Kinkade art, sweetheart cottage, falbrooke thatch, cottage paintings, Sweetheart Cottage II, cottage art, Sweetheart Cottage 2, sweetheart cottages, cottage, waterfall, Thomas, Tom, Thom, Kincade, Kincaid, Kinkaid, Kinkade, art work, canvases, images, paintings, pictures, and prints of Sweetheart Cottage II by artist Thomas Kinkade for sale. 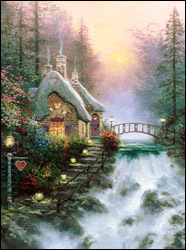 Sweetheart Cottage II painting by artist Thomas Kinkade can be purchased in art print on canvas form at special sale prices at Christ-Centered Art.